We have all been there. You have a small period of time when nothing goes right and, it seems, everything goes wrong. No idea when I first heard the phrase “everything happens in three’s” but when a couple of things happen that you put down to “bad luck” within a few hours, you “sense” the third is coming. On Thursday morning I received a call (6-40am), from Karen’s daughter who had left for work. She had suffered a puncture not far from home and didn’t know how to change the tyre. I whizzed around to help her out and was stunned to see a spanner….a whole spanner….was embedded in it. I put the spare on and she made her way to a local tyre place to await them opening, whilst I returned home. 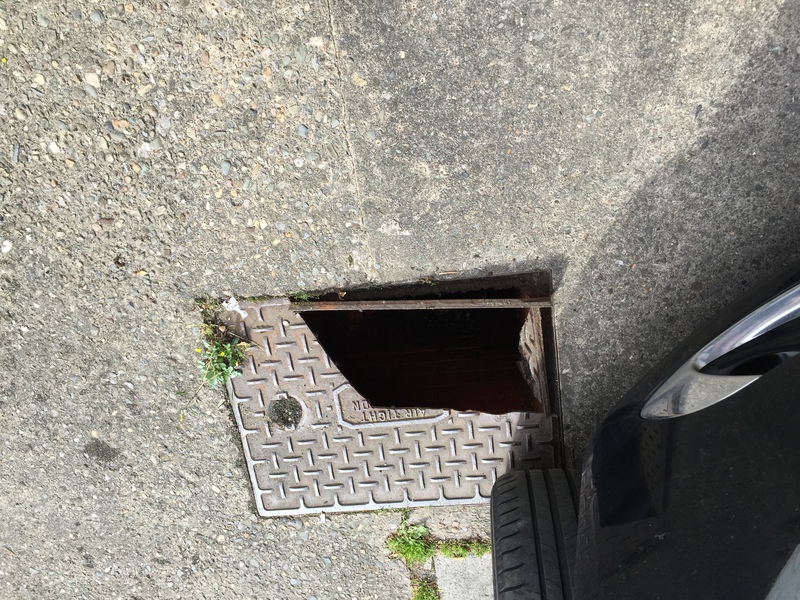 As I drove onto our drive I ran across the air tight inspection drain cover and it shattered. This had, because of it’s position, been driven over 000’s of times but on Thursday, it chose to shatter. Had I been going a little slower, my front wheel would have gone down a couple of feet and the front end of my car made a mess of. United Utilities came out, said they’d have it fixed within the next 28 days. Now I’m waiting for that “third thing”. I believe that creates a mindset and you “cry it in”, as we say here. Convince yourself something will happen, you make it happen. However, the rest of the day went without a hitch and I gave myself a kicking for being so “negative”. Last night I took Karen, as part of her birthday “package” to see Maroon 5 at the Echo Arena in Liverpool. I had booked a table at a local restaurant a couple of weeks ago and those tickets for the gig had been on our notice board for a month or more. The traffic getting there was a pig….no other word for it….and we were five minutes late getting to the restaurant. Nice meal, we walked the short distance from restaurant to Arena and were about to go up the steps to our point of entry when a group of blokes standing in florescent jackets called out, asking if we were going to the gig. We said we were….the head guy told us it was cancelled and gave us a piece of paper to advise what happens next, with regards refund. Lead singer had a sore throat apparently. Before going to Liverpool though, Sean and I had planned doing the podcast at 1-30pm due to the fact I had appointments here, there and everywhere in the morning. I had spent 90 minutes prepping my work for that and at 1-20pm the doorbell rang. It was United Utilities and they had come to fix the drain cover. They were going to have to enlarge the hole to put in a more robust lid, which meant them using a “whizzer” to cut through the concrete and brick. I called Sean to advise we would have to cancel, just as they commenced work and with my office at the front of the house and their location about 20 feet from me, the noise (I’m sure he can confirm), made a podcast impossible. Was he available to “come and kick away a stool”, I asked. Because the gig was cancelled we opted to come straight home and I was back in my office by around 7-40pm. A bit of a blessing in disguise I thought because it meant that work I would have been doing until around 1-00am this morning could be done now. It also meant I could watch the racing whilst I worked and, with a lay advised in the Catterick 8-40 I could look at the potential to work that race a bit more. I slightly increased my liabilities…not by much because, as I’d said in my text on Tippedtolose, this was a shocking race….long story short, my lay won by a short head. It had to though, didn’t it? Not a couple of lengths going away…a short head. Ground and trip were wrong…if it had one that would ever suit. It had never won in 16 previous runs on turf…a short head? Nothing can go wrong, every single top rated horse is going to win by 10 lengths, I’m going to lay a dozen short priced favourites and the lottery ticket is worth bonzas. It’s a very, very busy one with five meetings and a host of rated races to look at. I do not like the look of Chepstow one little bit and will swerve that. Below you have full figures for all rated races and I am keen to get these to you before 9-30am. I will have them up on the website shortly and will add text to those of most interest. I have a fair few very much of interest today and they have also been added to the Newsletter and we all know that mach of those will absolutely bolt in….I mean, it’s my turn today, isn’t it? We will be seriously getting stuck in here from Monday as summer arrives….officially. May has been a weird month but I have been extremely happy with how this new service has started. It will get better as we see drier, warmer weather and formlines being to settle down. Rails: The entire length of running rail has been moved out by 3 to 9 yards. This means actual race distances will be: Race 1/2/4- 6f 57y(+39y), Race 3- 7f 161y(+39y), Race 5- 1m 5f 158y(+69y), Race 6- 1m 4f 126y(+60y), Race 7- 1m 2f 116y (41y). 6mm between 6am and 10am yesterday with a further 1mm overnight. Forecast: Very light early morning shower turning to a dry afternoon, max daytime temperature of 14c. Rails: Rail position for Saturday 30 May: rail out 3m on South (home) bend adding 7 yards to race distances of 1 mile and over. Stalls: Stalls: 6f and 7f – farside rail; 5f and 1m4f – centre; remainder – inside rail. Watering: 2mm applied Tuesday 26 May. A further 3mms rain overnight, making 10mms in the last 36 hours. Met Office forecast: Saturday – Dry,sunny and 15 degrees. 7mm of rain in past 24 hours, including 1mm overnight. Dry and bright morning and bright forecast for the day. Max temperatures 16 deg C.
Rails: Will be racing on the Far Side Course which was last utilised in April at the Craven Meeting. Watering: 3mm applied to the course after racing on Friday. 3mm of rain on Friday morning. Dry afternoon and overnight. Saturday: Dry and with sunny spells. Forecast: A dry day with sunny spells. Rain coming in later tonight. Max temp 16C. NOTES: I have two in my top six having draw and ground right. I always see Navajo Chief as needing a nice long straight to aim at and York suits him perfectly. Only one run here previously and that saw him finish 5th of seven. He does seem to be getting harder to win with but, in his favour, he has won first time out for the last two seasons. WILDE INSPIRATION has been here twice before and finished 2nd and 3rd. With no no ground an inconvenience on all known form to date, he’s got to be competitive this afternoon. MARCRET has won here on there separate occasions. He would not want conditions to get any quicker than good but, with the sun shining and a lovely afternoon in prospect, it may well hinder his chances. BERTIEWHITTLE has won on one of the two occasions he has raced here (form figures at chester read 3, 1),…so why have they not let him return since he won way back in 2011? Strange one. I am happy to work with rated horses 1, 2 and 4. NOTES: I hate races in which one trainer is responsible for a 1/3rd of the runners and David O’Meara has no fewer than five of the 16 runners. A few days back he had three of eight and took it with his 25/1 outsider. Not surprisingly, the favourite was boxed in and could never get competitive. I am thinking a low draw may have scuppered ALFRED HUTCHINSON today but both turf wins to date have come here (over a mile, winning by a neck and a head), so you cannot discount him and you certainly would not want to be a layer. DUSKY QUEEN has won three times at York….definitely one to have on side given that rating this afternoon. Good ground is spot on and it’s just the step up in grade which might find her out. Everything though, hinges on what the O’Meara crew get up to during this race. NOTES: Don’t blink. I have three in my top six with draw/ground “right”…. WILLBEME, a winner of five of his 18 races to date, has a great box to run from, is 1-3 at York, will be suited perfectly to how this will be run and his demolition job of BONDESIRE here last June augurs well. DUKE OF FIRENZE has that trio of icons and with a trip/ground record of 3-11 and 4-11 respectively, you know this one can be competitive for a trainer who knows for sure how to get a sprinter ready. ANCIENT CROSS….a Tim Easterly runner who is 2-18 at York, has winning form at the trip and on the ground provided today and with the trainer having had a nice Haydock winner yesterday, it’s a yard in form that we have on side. Ok, he’s now an 11 year old with several of these having the potential to improve right past him but if Easterly didn’t think he still had it in him, he’d not be here.